When Facebook first launched its Reactions quick response options back in 2015, they came with the potential to be an amazing tool for marketers, another way to get more into insight into what their audience was thinking, what they wanted to see and what they best responded to. But Reactions never really lived up to that promise. A year after their release, Facebook reported that Reactions had been used 300 billion times in total – which sounds like a lot, but for context, Facebook generates around 4 million Likes per minute, equating to some 160 billion Likes each month. From a broader perspective, Reactions have remained only a very minor part of the wider Facebook engagement picture, meaning the data insights they provide are fairly inconclusive – but there have been some interesting trends in Reactions use of late that may be worth noting. 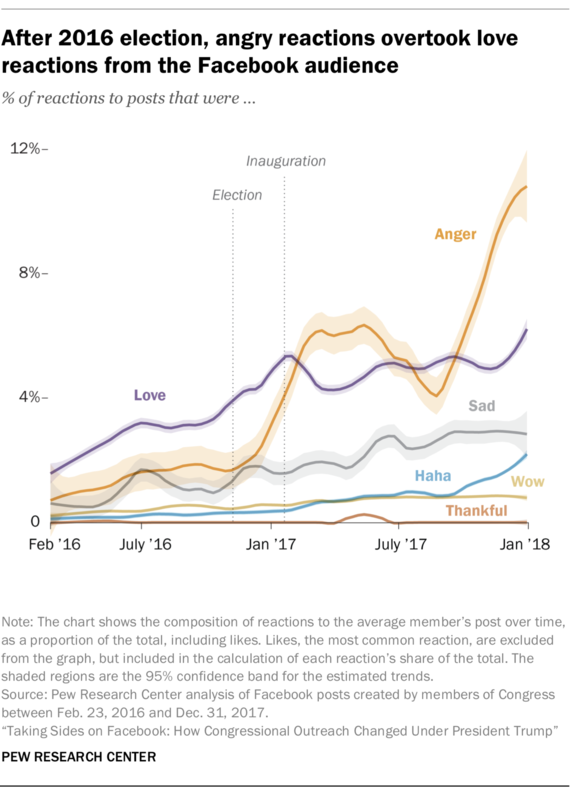 According to a recent report from Pew Research, use of the ‘Angry’ reaction is rising, particularly among politically affiliated Pages. As noted, this is a fairly specific audience – and Pew notes again that Likes remain the most common Facebook response by far. But it’s interesting to note the shift in usage, and how people who don’t have a dislike button may be turning to the ‘angry’ emoji as a replacement. Social analytics company Quintly found similar – six months after Reactions were launched, Quintly reported that 'Love' was the most used Reaction by far, but their latest report shows that ‘angry’ is rising, as is overall Reactions use. Are these stats more representative of the broader adoption of Reactions as a response tool, or of the more politically fractured landscape we find ourselves in? Definitely, journalism, as a practice, has been significantly impacted by web distribution - obviously from a consumption perspective, but also in terms of content. With publications now able to track the performance of each individual article they publish, based on clicks, social shares, responses, etc. that enables them to see which posts incite the most of each metric. And as social platform algorithms continue to emphasize comments and response, it makes sense that publications are turning to more divisive, argument-triggering posts – which, in turn, leads to further division and tribalism online. That’s not a criticism of how it’s being handled, that’s the nature of the modern media landscape – you’ll get more clicks on a post which clearly takes a side than you will on an objective, balanced headline which presents an unbiased view. We’re seeing the impacts of this in varying capacity, and maybe now, we’re also seeing the same in Facebook Reactions use – which, as noted, is rising, and which Facebook is now rolling out to its Stories tools on both Facebook itself and Instagram. From a marketing perspective, Reactions are still not likely to be of major benefit to your analytical efforts - but it is worth considering how they’re being used, and what your business may be able to do to inspire more Reactions on your posts. Reactions are weighed more heavily by Facebook’s infamous algorithm – Facebook takes their use as an indicator of higher engagement from a post reader. That doesn’t mean you should seek to make your audience angry necessarily, but inspiring Reactions use can work in your favor. And with brands scrambling to find new ways to increase Facebook reach, and with Reactions now available on more surfaces, there's more opportunity than ever to do so. The trends show Reactions use is rising, people are becoming more habitually attuned to their application. Worth considering in your process.